Are you using these statements when frustrated at work or home? Are you using these types of statements when frustrated with people in your life? S/He “is” lazy, arrogant, always late, irresponsible, unreliable, or ________. S/He “is” a procrastinator, poor writer, a weak communicator, a__________. Do you see a problem with the above statements? When we use “is” statements, we look for evidence to show our judgment is correct. For example, everyone knows someone who they think is always late. Let’s imagine the person now arrives on time or even early for every meeting. We are likely to notice (focus or overemphasize) the one time he or she runs late to reinforce our prior conclusion that he or she is always late. Hence, it becomes difficult, and sometimes even impossible for us to see someone differently, once we’ve decided that he or she “is” _______. 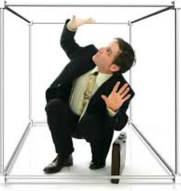 “Is” boxes can be just as harmful and constricting when we use them to describe ourselves. How many times have told yourself, “I am overweight”, “I am stupid”, or “I am clumsy”. These statements often become self-fulfilling prophecies. In the workplace and at home, “is” statements are dead-ends! Contrary to what people may think, we all have enormous capacity to change. Every moment we are alive, we make choices. That means every day we have many, many times to make different choices. What happened in the past does not have to determine the future. This month we challenge you to become more aware of minimize your use of "is boxes". Contact us to learn how your organization can increase its profitability by improving communication and productivity: Jodi@eisenalliance.com or (312) 914-0155.